A philosophy journal that focuses on the teachings of philosopher Alain Badiou has apparently fallen victim to yet another Sokal hoax, and has retracted a fake article submitted by authors trying to expose the publication’s weaknesses. The paper, “Ontology, Neutrality and the Strive for (non-)Being-Queer,” attributed to Benedetta Tripodi of the Universitatea Alexandru Ioan Cuza in Romania, is apparently the work of two academics, who submitted the absurd article to Badiou Studies to expose its lack of rigor in accepting papers. Since “gender” has been continually the name of a dialectics of the continued institution of gender into an ontological difference and the failure of gendering, it is worth addressing the prospects of any gender-neutral discourse through the tools of Badiousian ontology. As established by Badiou in Being and Event, mathematics – as set theory – is the ultimate ontology. Sets are what gendering processes by reactionary institutions intend to hold, in contradiction to the status of the multiplicities proper to each subject qua subject. This tension between subjectivity and gender comes to the fore through the lens of the ‘count-as-one’, the ontological operator identified by Badiou as the fluid mediator between set-belonging and set-existence. After having specified these ontological preliminaries, this paper will show that the genuine subject of feminism is the “many” that is negatively referred to through the “count-as-one” posited by the gendering of “the” woman. Needless to say, we can find no record of a Benedetta Tripodi at Universitatea Alexandru Ioan Cuza. They contest what is in effect a legitimation of philosophy by an abstract ontology (une légitimation pour la métaphysique du philosophe). Or to be more clearly, the idea that you can produce a rational picture of the world by intellectual fiat while concealing the many difficulties it involves. The parody is designed to undermine the foundations on which the ontology of the ‘Master’ rests, its use to determine how social relations work, how radical politics can be based, and, apart from anything else, is highly amusing. Badiou is also known for his ‘Maoist’ past, his support for the Khmer Rouge, and the bullying of other leftist and academics by his 1970’s groupusucle the Union des communistes de France marxiste-léniniste (UCFml). He remains unwavering in his glorification of the Chinese Cultural Revolution. This apparently is one of theEvents that demonstrate the Truth of the Communist Idea to which he remains faithful. Given our stance as a journal that aims to dispel the celebrity fetishism surrounding Badiou (in our journal ethos), we of course support the intentions of the authors. 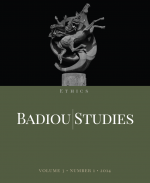 However, unlike significant work done to challenge Badiou’s thought philosophically (some of which is published in our journal), we regret that the authors chose such a dated method of attack. In an age when the pressures on independent Open Access publishing include underfunding and time-pressured staff, Sokal-style exposés become easier to perpetrate even as their philosophical payoff becomes less and less. The experimental nature of the issue in question made it particularly vulnerable to such an assault, which seems designed less to ‘undermine the foundations on which the ontology of the Master rests’ (whatever that means) than to use Badiou’s name to promote the authors’ own careers. Sadly, we will have to ensure that future issues do not engage so readily in experimental formalism. Last year, a pair of sociologists did essentially the same thing, submitting a fake paper to a journal to spoof the work of its editor. That paper was also retracted. We’ve contacted Huneman and Barberousse, and will update if they respond. The aim of the Badiou Studies hoax was to disclose a certain way of doing philosophy, mostly exemplified by Badiou, whose fame and philosophical reputation appear to us illegitimate. Therefore, the first target of the spoof was the specific legitimizing strategy that allows Badiou to appear as the “most important French philosopher” (as he often says), whereas all indexes that consider mainstream academic journals and textbooks in philosophy could not support such an assesment. This legitimizing strategy actually relies on a fame elaborated in anglo-saxon context, and then is imported into the french context in order to provide this author with the status of an internationally praised thinker. Our point is that our paper has been written in a way that is rhetorically much too close to standard Badiousian, Badiou-centered or Badiou-friendly (or friends-of-Badiou-friendly) writings, to easily believe that its acceptance in such a journal is just a fluke. Rather, its publication in a supposedly serious journal (e.g. not a predator journal, etc.) sounds problematic. Thereby, given that such a journal is one instantiation of Badiou’s status as a world-famous thinker, our hoax invalidates (or at least, jeopardizes) the legitimacy of such status. As we illustrate it in the Tripodi paper, the way of doing philosophy embodied by those texts that share its rhetoric consists in accumulating coded expressions, which don’t make sense by themselves but rather serve as echoes of other expressions from the Master. Words here function as “tags” rather than concepts, as we suggest in the post-hoax analysis published in French in Carnet Zilsel. We also point out that Badiou’s idiosyncratic writing style about mathematics and metaphysics, which is parodied in the Tripodi paper, accounts for most of its appraisal among scholars who are familiar neither with the technical – philosophical and mathematical – issues touched upon by his metaphysics, nor with the standard literature and language that deal with them. Thus, the engine of this philosophical rhetoric is free association of ideas rather than carefully assessed inferences from premises supposed to be well understood by both the author and the readers. We consider this way of doing philosophy as illegitimate because it does not take place on the common grounds of rational discussion. Philosophy can be a highly specialized discipline, with its technical vocabulary, but when technical words are not used to the aims of clarification or progress in sound reasoning, they have to be given up and not piled up for (dubious) aesthetics effects. But, as one could object, can’t people freely philosophize in whatever way they like? Yes, of course – except in academic journals, whose peer-review system is usually considered as a barrier against non-sense, and should thereby prevent any tag-motivated philosophical discourse. The Tripodi hoax intended to trigger a discussion about a drift in academic philosophical standards of argumentation, happening when academic philosophy hybridizes with other theoretical fields such as Cultural Studies, Film Studies, etc. – a situation that, according to us, accounts for the specific fame of authors such as Badiou, Zizek or others. We believe that all disciplines would benefit from reasserting or strengthening those standards. On a more particular and local note, we feel that the influence of Badiou’s writings on both academia and intellectual life in France had to be pointed out because, when the market is full with papers and books influenced by his school, it is difficult to see that more understandable and valuable work is done in philosophy. We think, for instance, of works in political philosophy or philosophy of mathematics and science (at least in France). For the French non-academic reader, it is indeed difficult to find out that Badiou is not the only or most important thinker. This is why we wrote the Tripodi paper and its commentary, which analyses Badiou’s spurious influence in our country. In addition, we emphasise that both of us having in the French academic system senior positions with no room for further improvement, we cannot hope this affair will promote our careers (as it has understandably but wrongly been claimed), nor fear any retaliation. I have another explanation. In an age when academics engage in utterly incoherent word games designed to obfuscate and hide their ignorance, Sokal-style exposes designed to expose that incoherence and ignorance (and its malevolent undertones of phony transgressive negativity) become easier to perpetrate. I certainly hope this is only the early phase of such fun. Let the games begin. If they start sending articles back if the abstract doesn’t make sense then fairly quickly people submissions will stop. They should be using the same rule that is used in scientific articles; if it doesn’t answer a question then it doesn’t get published. A sensible response would be to “not do something” when you are “underfunded” and “time-pressured”. Doing nothing well seems wiser than doing something/anything poorly. When in doubt, don’t. 1st Paragraph/1st Sentence – “trying”? Go ahead, boldly leap to the conclusion – they succeeded. It’s interesting that their main criticism of the authors is that they used a dated method of making their point. Do they have no room for actually criticizing what they did? This has caused a minor outrage in the Philosophy Department at my Alma Mater, the University of Woolamaloo where there is a very active Feminst group that watches ‘events’ (in the Badiousian sense) very closely and prevents (ibid) use of the photocopier room by non-feminists (Feminist-not-being). It is only in the past year that they have successfully dealt with the disturbances over ‘Aboriginal Feminism’ in the ‘Brucette Room’ and whether the photocopiers can be used by non-aboriginal feminists in the Department and indeed how Badiou ‘himself (as gender parsed and participled) would have integrated the ‘funding’ aspects with his (her, erts) proofs of antecedancy and communist purity. (He did a fine 1964 papaer on the natural communism of Aboriginals with examples of people’s belogings going walkablout). This latest storm has seen fourteen funding requests in just a week with virtually every member of the ad hoc committee working furiously on the paperwork while being hard -pressed to find time to denounce the ‘Patriarchy’ (Badiou’s own definition of which has been heavily criticised for its lack of denunciatory language, which some of the ladies see as a ‘sneaky and underhanded’ support for the century paradigm of male superiority that ‘must be smashed’). No-one has been free to stand guard over the Departmental ‘Safe-Space’. Who are the most important French thinkers in political philosophy according to the authors? Previous Previous post: Scientific misconduct and sexual harassment: Similar problems with similar solutions?